Quick take on today's Illinois Supreme Court opinion In re Jonathan C.B. By Kerry J. Bryson, Office of the State Appellate Defender In August 2006, the minor was charged with attempt robbery and criminal sexual assault by use of force. In the Supreme Court, the minor argued that he was not proved guilty beyond reasonable doubt, that he was denied due process when he was shackled during his trial without an individualized determination of necessity under People v. Boose, 66 Ill. 2d 261 (1977), and that Section 5-101(3) of the Juvenile Court Act was unconstitutional because juveniles charged with sexual offenses have a constitutional right to a jury trial. In a 69-page opinion, the Court unanimously rejected the reasonable doubt claim in light of the standard of review requiring the court to take the evidence in the light most favorable to the prosecution and to give deference to the findings of the trier of fact, here, the trial judge. The Court split 4-3 on the shackling claim, with the majority concluding that it was forfeited and that the record did not support the minor’s claim of error. Read more or comment about Quick take on today's Illinois Supreme Court opinion In re Jonathan C.B. By Robert A. Loeb The Blago nightmare is almost over. The federal jury returned a verdict of guilty on 17 of 20 counts against the former governor. Regardless of one’s personal opinion of his criminal culpability, and for that matter, regardless of the jury’s verdict -- he’s been a national embarrassment. Let’s not rehash the coverage in the news media here. We’ve already been inundated with that, and it was three whole news cycles ago. And even though he invoked Elvis once again as he waited for the verdict (“my hands are shaking and my knees are weak”), I’ll try hard to refrain from further cheap Elvis references at his expense. Even though other song titles from Elvis include “That’s what you get for lovin’me,” “Jailhouse Rock,” and “Please release me.” Rather, let’s take a look at the case and the verdict from a lawyer’s perspective. The media is asking, “how was the second trial different from the first, and did that difference help produce a different result?” I’m not so sure they were very different. Sure, the difference between a hung jury and a conviction is great, but is the difference between an 11-1 vote and and a 12-0 vote so significant when evaluating trial tactics? It has been reported that the government streamlined the case against Blagojevich, eliminating some counts and some evidence in an attempt to make the case clearer to the jury. Both juries seem to have been thorough and meticulous, but it still took this jury two weeks to deliberate, and an indictment with 20 remaining counts is not exactly simplified. I’m suggesting that the government did not really need to alter its case after the first trial. From the defense point of view, the fact that different lawyers represented Blagojevich in the second trial may have lessened the entertainment value, but the cross-examinations of witnesses parroted the successful moments from the first trial. I had a doctor's appointment this morning and brought along an old friend for companionship, Plain English for Lawyers (5th ed. 2005) by Richard C. Wydick. It's about 104 pages of advice that is as helpful today as the first time I read it. I would analogize it as the Strunk and White for lawyers. It's now on my list to re-read once a year. I had forgotten how good this book was. 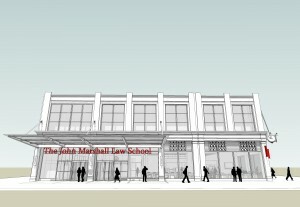 John Marshall Law School's expansion will feature a new entrance at 304 S. State. By John W. Olmstead, MBA, Ph.D, CMC Q. In a recent firm meeting the question was raised as to whether law firms hit a wall when they run up against new competitors, new technologies, new business models, or when their talent peaks. Is there a general model of sustaining a law firm? A. The mechanics of managing a law firm are too complex to address in this forum. It would be better to discuss what to tell you what to look for that tells you, well in advance of a fee revenue plateau, that your practice needs some work. Once you know where your practice is getting wobbly, then you will have a clearer idea of how to fix the mechanics. We tell our clients that often a law firm is on an "S-Curve" in which slow and steady growth often occurs at the start of the law practice, followed by gaining momentum and rapid growth, then tapering off as practice areas get saturated or competitors enter the practice areas in which the firm is engaged. Watch these components for advance warning: 1. Competition - any practice area attractive to you will also attract other law firms, so monitor new entrants starting to chip away at your clients. 2. Capabilities - you created or bought some new technology, skills or other assets to start your firm/growth, but the distinctiveness of these eventually wears off and they are likely to be available to competitors once their value is clear. 3. Talent - you had it when you started your firm, but attorneys and staff have become "free agents" and increasingly move between law firms more frequently and you may lose a key asset. There may be other components unique to your practice and market. The students interact with Tuesday's speaker, Northwestern Law Professor Sheila M. Maloney. The Illinois State Bar Association's Law and Leadership Institute has rolled into its second week -- and the students are loving it. They enjoyed visits to the Daley Center and 1st District Appellate Court on Friday. The students got to witness a trial in Traffic Court at the Daley Center spent nearly three hours discussing a variety of topics with Justice Bertina Lampkin at the Appellate Court. Justice Lampkin even walked the students through her famous dissent in the Rahm Emanuel ballot case. On Tuesday, the students were treated to a negotiations class with Northwestern Law School Professor Sheila Maloney. Click here to view pictures from the court visits. Click here to view pictures from the negotiations class. The Institute continues through July 8 at the John Marshall Law School.